The clipped sentences and imprecise number of napkins are all in the French original. Thousands of subsequent “minimalist” writers have tried to recapture the effect of this moment. The same flat style that is tedious when describing a dinner party becomes sublime in the presence of death. Who would criticize such a scene for lacking ornament? Many of those later writers, especially those who wrote short fiction, thought something like “Why not just cut out the boring dinner party scene and just keep the really powerful moment?” And some succeeded in doing just that, while others only managed to make emotionally rich moments dull. 4. Beauty. Such moments are among the easiest in Sentimental Education to call beautiful, as are the moments of elevated language, the garden of asparagus “which looked like a little forest of feathers” (2, 5) and so on. I could imagine an aesthetic in which the flatter, plainer, duller passages are meant to contrast with – pump up the significance of – the heightened moments. A risky strategy, boring the reader. Flaubert, though, considers the novel to be beautiful all the way through. Any surface dullness is of no consequence because he can see the hidden patterns he has carefully constructed underneath the flat surface. They are always there somewhere, they are beautiful. I have increasingly wondered why Flaubert was so committed to the form of the novel. Why do so much research if the good part is the part you make up? Why not write prose poems, or Finnegans Wake, or The Rings of Saturn? The latter gives me a clue. Flaubert, I am often told, is a “realist.” And he is. 5. Metaphysics. Here I need help. I am going to get it from Erich Auerbach’s Mimesis (1946, tr. Willard Trask). Auerbach describes Flaubert as a kind of mystic of reality, the devotee of a theory “of a self-forgetful absorption in the subjects of reality” (486). The purpose of the artist is “to transform reality through style; transform it so that it would appear as God sees it, so that the divine order – insofar as it concerns the fragment of reality treated in a particular work – would perforce be incarnated in the author’s style” (357-8). The representation of reality by the artist is more beautiful and meaningful than reality because the representation is more real. There is a strong dose of Schopenhauer here, although I doubt he is Flaubert’s source. The artist – the great artist? – is, in a limited way, able to glimpse the real reality behind the usual false reality which he then represents as a new false but improved reality. And that’s the best you can hope for. Thus the subject does not matter, the characters do not matter (although being able to take jabs at some bourgeois enemies is a pleasant bonus), or they only matter arbitrarily as material for the creation of the marvelous new object. “[I]n his book [Madame Bovary] the world consists of pure stupidity, which completely misses true reality, so that the latter should properly not be discoverable in it at all; yet it is there; it is in the writer’s language…” (489). No one is obligated to believe any of this to read Flaubert successfully. I believe Flaubert believed it. A number of later writers, too. What do the patterns, repetitions, and obscurely linked details in Sentimental Education mean? Oh, so many things. 1. Individual psychology. Some of the patterns are created by the characters, perhaps unconsciously. They are also created by Gustave Flaubert, but they are given to the characters. It is Frédéric who always notices ribbons and who associates them with his love affairs. He may not realize he is doing this. He is not especially perceptive. 2. Heightened perception. But sometimes he is more perceptive. Flaubert signals these moments with his signature semicolon lists. Poor Cisy is about to fight a duel in which he assumes he will die (he is incompetent) so all sort of trivia becomes intensely interesting to him (“At the corner of a path a woman in a madras kerchief was talking to a man in a smock”). Meanwhile Frédéric is experiencing something similar, even if he is less certain or terrified of death. So we have not just one but two characters who are suddenly unusually alive and perceptive, and the entire passage, a famous one, is written accordingly. “A ray of sunlight, passing through the leaves, fell upon them; and to Cisy’s eyes they seemed to shine like silver vipers in a pool of blood.” The sacking of the Tuileries Palace is another good example (dog alert!). Love and death, those are the cause of heighted sensitivity in the characters, when they become – well, when they become more like Gustave Flaubert, when even a dip like the novel’s hero develops an aesthetic sensibility. Actually, there is a simpler impulse that has a similar effect, hunger, thus the frequent menus of multi-course meals. It is not quite right to say that Flaubert describes the dishes. He writes as if he were the waiter. Frédéric is an idiot. Also, I missed the pies when I was in Chartres and now feel cheated. To my initial point, the use of random details to create moments or states of heightened emotion and as the kinds of semi-conscious patterns people construct to make meaning out of their lives – “Then a vague memory occurred to him of other evenings like this, with similar silences,” to repeat a quotation I used yesterday – is psychologically sharp and fairly new as a technique of characterization, or new when used to this extent. Not actually new; what ever is? Meanwhile, Leo Tolstoy has discovered, from different aesthetic grounds, how to do the same thing. Note that none of what I have described really requires a reader to consciously perceive the patternings any more than the characters do. Sentimental Education can be successfully read and enjoyed as if it is not a radical avant garde anti-novelistic gesture (see Himadri do just that), in part because it is still a novel with all of the usual features – characters, plot, meaning. Flaubert, anticipating the French theorists of a century later, is aware to an unusual degree that he is simulating characters and meaning within an artificial form, but no reader has any obligation to notice. #3 on the list will be Beauty and #4 will be Metaphysics. And I have one more point to make about heightened perception, this time of the reader. Ribbons and dogs in Sentimental Education. Flaubert drops them into his novel frequently. I have mentioned several examples of both. A river bank is like “two wide ribbons,” the protagonist Frédéric disturbs a “couple of sportsmen with their dogs” before, in the next sentence, first seeing and falling instantly in love with Madame Arnoux. The pink ribbons of her hat are the second detail in her description (the first is the hat). Then her hair, her dress, her sewing (the character’s motif), and finally her face. Four pages later, while Frédéric is walking home, I find the next dog, and perhaps also the next ribbon. It is entirely natural to mention ribbons when describing the attire of French women at this time, just as it is natural to plop in a dog or two now and then. But as much as Flaubert is known for his sensory descriptions, what he mostly does is omit the scenery. He just picks out a few things, the things he is going to use and reuse. At last they would come back by the Arc de Triomphe and the great avenue, drinking in the air, with the stars above them, and all the gas-lamps down to the end of the vista lined up like a double string of luminous pearls. The water metaphor is repeated with Rosanette, too. “The sun shone on the cascade, and the greenish stones of the little wall over which the water was flowing seemed to be covered by a never-ending ribbon of silver gauze” (Pt. 2, Ch. 5). There is at least one more of these (“the dusty paths looking like greyish ribbons,” 3,4). I have not sorted out the colors, but it looks like there is a scheme. The scene is one of the moral pivots of the novel, a turning point for Mme Arnoux and in consequence Frédéric, foreshadowed in the first few pages of the book in a passage that might make a reader shiver once he knows what Flaubert is doing. Next I will try to make Sentimental Education look a bit less like a word association puzzle. The first line, and paragraph, of Sentimental Education announces a date, time, and the names of a dock and a ship, with “clouds of smoke pouring from its funnel,” a detail that fills me with dismay, but I will have to hold that thought. At last the boat moved off; and the two banks, lined with warehouses, yards, and factories, slipped past like two wide ribbons being unwound. The novel’s first metaphor! And a good one. When Flaubert wants to be, he is a master of figurative language. How frustrating that, if I understand his method of composition, he spent so much time excising metaphorical language from his fiction. He wrote ‘em then killed ‘em. Aside from ordinary uses of language, there is not a hint of metaphor for another two pages (a “curtain” of “pale poplars” on the shore). Here and there a coffee-stained calico shirt showed under a knitted waistcoat, gilt tie-pins pierced tattered cravats, and trouser-straps were fastened to list slippers. [More clothes] The deck was littered with nutshells, cigar stubs, pear skins, and the remains of sausage-meat which had been brought along wrapped in paper. [More people, more clothes] To get back to his seat, Frédéric pushed open the gate leading to the first-class section of the boat, disturbing a couple of sportsmen with their dogs. She was wearing a broad-brimmed straw hat, with pink ribbons which fluttered behind her in the wind. Her black hair [a sentence about her hair, another about her dress]. She was busy with a piece of embroidery; and her straight nose, her chin, her whole figure was silhouetted clearly against the background of the blue sky. Is this not just one more arbitrary list of plain details or even just nouns (“her chin”)? Everything I skipped is more of the same, except that among the details I have chosen to include, there are some that I know have particular artistic significance, that are going to be repeated at key moments all through the novel. To my knowledge the coffee-stains and pear skins are merely incidental detail, atmosphere, so I can set them aside, while the ribbons and dogs I am going to need. Remember that the ribbons first appeared in the metaphor in the third sentence. I think these are the first dogs. These motifs are going to be used by Flaubert to create a hidden pattern of correspondences behind the surface of the novel. My next post, which may not appear for a couple of days, is going to be nothing but ribbons and dogs. My little howl of frustration in the first sentence of the post come from realizing at that moment that the smoke from the ship’s funnel is the beginning of – the smoke theme? no, how absurd – the feather theme that I completely missed. The link is one of those outstanding but rare metaphors that appears 368 pages later – “the smoke of a railway engine stretched out in a horizontal line, like a gigantic ostrich feather whose tip kept blowing away.” The ostrich feather theme is a sub-theme of the feather theme. All of this is completely invisible except by chance the first time through the novel. Ford Madox Ford claimed, in a quotation – not even that, a paraphrase, for which I have never seen a real source, so it is likely nonsense – that one has to read Sentimental Education fourteen times to really get it. I am not even close. Flaubert hammered Sentimental Education until it was flat, even flatter than Madame Bovary. A line that epitomizes the flatness: “They chatted about the subject under discussion” (Pt. 1, Ch. 5). I can think of a number of later writers working in Flaubert’s tradition who would not have allowed such a line in their books except as some kind of grotesque joke. Received criticism praises Flaubert for his beauty – I hated Emma Bovary, I hated spending time with these horrible people, but of course the writing is beautiful – and I will argue later that Flaubert creates works of great beauty, but the beauty is only occasionally at the level of the sentence. The search for le mot juste is a destructive process. Flaubert builds up a scene, fills it with adjectives and metaphor, and then strips them out before I or anyone else gets to see them, pounding the prose back to flatness. In fairness, I will note that Sentimental Education is aesthetically more radical than Madame Bovary, more unforgiving. When Eça de Queirós wrote his version of Sentimental Education’s relatively vivid horse race scene he made every sentence interesting, packing everything in the novel into one magnificent long chapter. Zola worked in the same way; so did Proust. Flaubert is the father of this kind of maximalism but oddly also of minimalism. The party stopped beside a fisherman, who was cleaning some eels in a tank for live fish. Mademoiselle Marthe wanted to see them. He emptied his box on to the grass; and the little girl went down on her knees to catch them, laughing with pleasure and screaming with fright. They were all lost. Arnoux paid for them. (If you were thinking of blaming the translator: “Toutes furent perdues. Arnoux les paya.” Baldick does have his troubles. “A good many began singing. Spirits rose. Glasses were brought out and filled” (Pt. 1, Ch. 1), which in French is “Beaucoup chantaient. On était gai. Il se versait des petits verres.” I guess “Many sang” sounded too primitive or ugly, although the next sentence makes up for it. It was at this point – on page two – that I began spot-checking the French. Oh come on, I thought, having forgotten how this book works, Flaubert did not write “Spirits rose”! But he did, or close enough. I do not know why Baldick did not want the glasses to be little. “What to do when the novel triumphs by boring you?” asks Miguel at St. Orberose. Admittedly this particular passage is really rubbing it in. Miguel suggests focusing on the good bits – metaphors, imagery, satirical jabs – some of which are extraordinary. I’ll do some of that tomorrow. Then I’ll work a little on the other way to read Sentimental Education, even though it is a bit beyond me cognitively. I am never actually bored by Sentimental Education. It always gives me something to do. A shallow young man falls in love with a married woman he has barely met – he is in a heightened and susceptible emotional state at the time. The chance meeting and strange reaction influence or even determine almost everything he does for the next decade of his life. Or more accurately everything he does not do, since Gustave Flaubert’s Sentimental Education (1869) is the great nineteenth century novel of missing the main event. More events almost happen than happen, if that makes sense. Or they happen elsewhere, with our hero – is that ever the wrong word – Frédéric Moreau just missing them. Flaubert does not quite have nothing at all happen, but he comes as close as he dares. Frédéric repeatedly almost begins a sexual affair, with the woman he meets on the first page or with someone else, or almost marries, or almost finds himself involved in some kind of revolutionary activity (the novel hinges around 1848). He is involved in a duel which turns into a farce, so it is too much to say he fights in a duel. He is present at the 1848 sacking of the Tuileries Palace, a great scene, although as a witness more than a participant. The Tuileries scene is so memorable that I remembered the novel as having far more scenes of political violence than it really does. So much of what Flaubert is doing in Sentimental Education, his radical aesthetic method, is visible in this passage, but I want to save that for the next few days. Keep an eye on that dog. The dubious, amoral Frédéric is in a predecessor of Proust’s Marcel in that his behavior and thoughts, if that is the right word, always make him seem several years younger than he really is. The novel is full of jokes at his expense. “And in a sudden burst of animal health, he resolved to lead a selfish life” (Pt. 2, Ch. 1). The joke is that a quarter of the way into the novel I had yet to see him live any other way. Pure self-delusion. Or see this one, when Frédéric realizes that he has a chance of an affair with a wealthy woman: “Greedy, in all probability, for power and action, and married to a mediocrity who she had served devotedly, she wanted a man of strong personality to guide her” (Pt. 3, Ch. 3). Fifty pages from the end of the novel, I can be certain that if she is interested in Frédéric it is cannot possibly be for his strong personality. What Proust’s protagonist has that Flaubert’s lacks is an aesthetic sensibility. And people call Sentimental Education “autobiographical”! For the next few days, nothing but aesthetics. Nothing but style. Frédéric will reappear only to be mocked. I read Robert Baldick’s translation in the same Penguin Classics edition I read twenty-five years ago. Sometimes I figure out, or guess at, or trick myself into thinking I know what a book is doing early on, and then I take lots of notes and write about it for four or five days. And then sometimes a book remains a puzzle from beginning to end and I come to write about it having only written down a single quotation. Now that is vivid enough, but I picked it for that laughter in the middle that I finally, by the end, could identify as a description of not just the narrator’s but the novel’s mood, maybe even its ethos. Mattia Pascal is – well, first, unlike Luigi Pirandello, he is not Sicilian. I read forty pages before I figured out my error and jerked the characters and their hovels out of Sicily and dropped them up north, closer to Turin. His French name provides a clue. Mattia Pascal is on the run from his miserable married life when he 1) lucks into some money and 2) read in the newspaper that he has killed himself. He takes his chance and creates a new identity and life. The legal, ethical, and existential complications of the new life eventually lead him to kill off the second identity and return to a version of the old, at which point he becomes the fellow named in the title. That is exactly the moment of the above quotation, a moment worthy of Homeric laughter. The arbitrariness of Pirandello’s story is an ingenious conceptual move that made the novel difficult to pin down. Pascal’s life is the one that happened, one of many possible lives. Given the chance to make a new life, he makes another series of arbitrary choices (also some less arbitrary choices) and experiences another set of contingencies. He rents a room with a theosophist, for example, which drives a surprising amount of the later plot, especially in an amusing séance scene. It is just something that happens (the theosophist would disagree). The Late Mattia Pascal is a novel of accidents. In a number of places, especially in the beginning when the narrator has trouble ordering his thoughts, Pirandello’s book reminded me strongly of the ironic digressive masterpieces of Machado de Assis, especially, obviously, blatantly, The Posthumous Memoirs of Bras Cubas (1881) – comparing titles is sufficient for my point. Perhaps next time I will read them side by side. Next time I might know what I am looking for. The translation I read is by William Weaver, published in 1964 before he launched into those great Italo Calvino translations. The edition, from The Eridanos Press, features thick, attractive paper with a kind of gridded watermark inside a cover marred by an irrelevant Giorgio Morandi painting that is ruined by the overall black-and-salmon theme. The one thing I knew about W. S. Gilbert and Arthur Sullivan’s operetta Patience, or Bunthorne’s Bride (1881) is that its central character, Reginald Bunthorne the Fleshly Poet, was a caricature of young Oscar Wilde. So the one thing I knew was half wrong. The flock of women in love with Bunthorne ask that he read his new poem. So if half wrong, also half right. Other details clearly identify Bunthorne as if not specifically Dante Gabriel Rossetti at least a paid-in-full pre-Raphaelite, obsessed with phony baloney medievalisms. But the women “play on lutes, mandolins, etc.” (pre-Raphaelite) but are also “dressed in aesthetic draperies” (rather more Wildean) and think the uniform of the Dragoons should be “made Florentine fourteenth-century” but then “surmounted with something Japanese.” A little of this, a little of that. PATIENCE. Well, it seems to me to be nonsense. LADY SAPHIR. Nonsense, yes, perhaps – but, oh, what precious nonsense! A little self-description there by W. S. Gilbert. If anyone is wondering why I am reading Patience – and not just that one, but H. M. S. Pinafore (1878) and The Pirates of Penzance (1879) – which tends to be a little hard on the contribution of Arthur Sullivan, the reason is first that in a performance of Gilbert and Sullivan I only catch about half of the words and second I can linger over the jokes. SERGEANT. No matter; our course is clear. We must do our best to capture these pirates alone. It is most distressing to us to be the agents whereby our erring fellow-creatures are deprived of that liberty which is so dear to us all – but we should have thought of that before we joined the Force. SERGEANT. It is too late now! Awfully funny performed, but similarly funny on the page, funny enough to reread immediately. In other words, I read the plays to read them. In practice, they are a pleasure to read. They are basically forty-page Bab Ballads, illustrations and all. Sorry, Arthur. The Wilde letters I read, running through his 1882 American tour, are before The Importance of Being Earnest, before The Picture of Dorian Gray, before his fairy tales, before his critical essays, before almost everything. In 1881 Wilde published his first book, Poems, which is, to be polite, and accurate, very much of its time. He had written his first play, Vera; or, the Nihilists, “a drama on modern Russia” (Letters, p. 96) which, if it had been written by the Wilde of the 1890s would be a great comic masterpiece but was instead written by the Wilde of 1880, a fellow who was still, to be polite, exploring his talents, and is thus dreary twaddle. The play reached the stage in 1883, where it remained for one week. A number of Wilde’s letters are to actresses and producers, badgering on about this awful play. I assume there will be plenty more of this stuff in the Letters, simultaneously tedious and fascinating, when Wilde is at his peak. Wilde achieved some celebrity, for his talk, his wit, as an Oxford undergraduate. He was incidentally a first-rate classicist. Early letters are about cramming, and then about celebrating his First in Greats. His wit is only lightly present in his letter to his friends. But of course he is not performing for them the way he would in public. He is “kill[ing] time and pheasants and the ennui of not having set the world quite on fire as yet” (28 November 1879, 84). (Young Wilde avidly hunted and fished). It is amusing, and also a little dull, to watch Wilde hustle. His obsequious letters to Robert Browning and Matthew Arnold* accompanying dedication copies of Poems mask what was simultaneously happening at London salons. Wilde was becoming famous for his jokes and paradoxes, not his mediocre poems, so famous that the London audience for Gilbert and Sullivan’s Patience (1881) assumed that the Fleshly Poet protagonist was a parody of Wilde, even though he is obviously Dante Gabriel Rossetti. Gilbert had made an error – the character should have been Wilde, and the audience (and soon enough the director and actor) behaved accordingly. Wilde was 26. In America the Wilde I knew begins to appear in his letters. The next four hundred pages of letters promise a lot of pleasure. * And Gladstone! Do British poets still send their first books to the Prime Minister? “[T]o one who has always loved what is noble and beautiful and true in life and art” blah blah blah yuck (20 July 1881, 113). Algernon Swinburne’s letters have been so much fun that I thought I would try out Oscar Wilde’s, which should be even more fun, or at least funnier. Well, not yet, not quite. I am reading The Complete Letters of Oscar Wilde (2000), ed. Merlin Holland and Rupert Hart-Davis, a book that has 1,230 pages of letters. I am up to page 192 at this point, when Wilde returns to England from his 1882 American lecture tour, which felt like a good spot for a break. Wilde’s letters are just beginning to be really funny. The trip to America practically turned him into Mark Twain. In England Wilde gave a lecture titled “Impressions of America” (1883) – it is in The Artist as Critic: Critical Writings of Oscar Wilde – that is pretty close to stand up comedy. I had to descend a mine in a rickety bucket in which it was impossible to be graceful. Having got into the heart of the mountain I had supper, the first course being whisky, the second whisky and the third whisky. That joke appears in two more versions in the letters, where Wilde was polishing it. So infinitesimal did I find the knowledge of Art, west of the Rocky Mountains, that an art patron – one who in his day had been a miner – actually sued the railroad company for damages because the plaster cast of Venus de Milo, which he had imported from Paris, had been delivered minus the arms. And, what is more surprising still, he gained his case and the damages. I was disappointed with Niagara – most people must be disappointed with Niagara. Every American bride is taken there, and the sight of the stupendous water fall must be one of the earliest, if not the keenest, disappointments in American married life… To appreciate it really one has to see it from underneath the fall, and to do that it is necessary to be dressed in a yellow oil-skin, which is as ugly as a mackintosh – and I hope none of you ever wear one. I read them passages from the autobiography of Benvenuto Cellini and they seemed much delighted. I was reproved by my hearers for not having brought him with me. I explained that he had been dead for some little time which elicited the inquiry “Who shot him”? Twain at this point would have tightened up the joke, or maybe spread it out, but he of course had twenty years of additional humoristic experience. Wilde was only 28, 29 when he was in America, lecturing the silver miners and amateur painters on aesthetics and dandyism and the art of the English Renaissance. Wilde gets funnier later. Heck of a job I have done writing about Wilde’s letters. I did not take many notes on Volume 11 of Constance Garnett’s Chekhov stories (The Schoolmaster & Other Stories). Not nearly as many as on Volume 12. Maybe I have nothing to say. The first story, “The Schoolmaster” (1886), kicks off the recurring “death and illness” theme. An esteemed teacher attends his fourteenth annual district banquet. Everything is just a little bit off this time, because all of the other teachers and administrators know that the schoolmaster is mortally ill, that this will be his last banquet. So this book is rough going. What relatively healthy reader is not looking at the teacher similarly, so to speak? Although we are likely to sympathize with his self-delusion in a way that his fictional colleagues cannot. Oh, the next story, “Enemies” (1887), holy cow. A doctor’s six year-old son has just died, minutes ago, when a man arrives demanding the doctor come treat his wife. A tragedy, however ordinary, turns farcical, and becomes more absurd as the story progresses. Chekhov is not above Maupassant-like twists – this book has a couple of good ones – although this story is more like a parody of the twist story. No clever ending is going to bring that child back. No pathetic fallacy is more genuinely pathetic than that of Anton Chekhov. Luckily, Chekhov breaks the mood in the next one, “The Examining Magistrate” (1887), which is more of a genuine comic Maupassant twist ending story. It features a doctor, a suicide, a betrayal, etc. but is nevertheless comic relief. Lots of comedy in this book, I remind myself. Chekhov may think that homeopathic medicine is a con, but he sets up a story so that the patients of a sincere homeopathic doctor are cheating her (“Malingerers”). A man (“the man whose new galoshes were stolen last year,” the best joke in the book, a detail tossed out as if I will just nod along, oh yes, that fellow) accidentally drinks paraffin but has the devil’s time convincing his wife or anyone else that he has poisoned himself (“An Inadvertence”). Another man is so afraid of being murdered by robbers that he overdoes it (“Overdoing It”). “A Play,” in which a budding playwright reads her manuscript to a famous writer, is close to something Mark Twain might write. “The jury acquitted him” is the last line. I guess that last batch are mostly throwaway stories, but they make the book readable. Thank goodness Constance Garnett had the sense not to compile the twenty most miserable Chekhov stories in one place. Well, I had something to say. A break from Chekhov now. I’m sure I’ll be back to him soon enough. “Shrove Tuesday,” published February 23, 1887 in a St. Petersburg newspaper. I read it in The Cook’s Wedding & Other Stories. Pavel Vassilitch should help his son Styopa with his math homework, but it is Shrove Tuesday, so everyone if full of pancakes. The fast begins tomorrow. Not a great time to concentrate on fractions. “’To be sure after pancakes, lessons are nasty to swallow.’” The father instead tells stories about his schooldays. The house is full of cats. Melancholy cats. The story is full of similes. Styopa “is swaying to and fro like a Chinese idol and looking crossly at a sum book” (132). “The old-fashioned clock in the drawing-room does not strike, but coughs ten times huskily as though it had a cold” (136). Newspapers in 1887 St. Petersburg were different than newspapers now. Better. “Art” (1886) is in the same volume, near the end, not about children at all but about the creation of a religious artifact, a “Jordan,” directly on top of a frozen river for an Epiphany festival at which the river will be blessed. The characters are a regional artist who is a prima donna and a lazy drunk but who has a real talent for this form, and his almost mindless assistant. “If he were told to stand on the river for a day, a month, or a year he would stand there” (267). They break the ice, make a frame and pegs – “whoever gets hold of a peg after the blessing of the water will be lucky for the whole year” – and dip a large cross in the water allowing them to care a dove in the ice that encrusts it. The artist drinks and complains, but the work gets done. I usually assume that stories about visual art are really about writing. In this case I am less sure. Chekov had no assistant. He was cranking out stories like I write these blog posts, and all in his own words, and at this level! But did Chekhov think of his newspaper stories as similarly ephemeral? Twenty-five stories in The Cook’s Wedding & Other Stories, seventeen about children in one way or another, five about animals in ways that are thematically relevant to the childhood stories, and then the last three, one a gag story about fishing, one about the creation of religious art and the other a screwy murder mystery, that as far as I can tell have nothing to do with children. All but one story from 1883 to 1888. The exception, “Whitebrow” (1895) is about a wolf and her cubs and her accidental adoption of a puppy – this is what I mean by thematically relevant, nothing more than that. Given that they are almost all little – six, eight, ten-page – stories cranked out on a weekly basis for newspapers, pure ephemera, there is no reason they should even be readable anymore, much less works of art. Hacks of genius are different than other hacks. Some stories are from the perspective of children. They are full of fine make-it-strange moments. They are written for those moments. The story practically ends with a Joycean epiphany, but at the level of a child who is not yet three. This next one rips off a classic Yiddish joke. “I learned my name is Irving.” Look it up; it’s a good one. It’s Pashka’s first trip to the hospital, one of many Chekhov compassionate but exasperated stories about the ignorance of peasants. The child’s perspective makes the ignorance more forgivable. Like it’s his fault. In other words, the boy has synesthesia. He is Vladimir Nabokov, twelve years before his birth. Nabokov’s colors were different – L white, M pink, etc. I can’t remember Nabokov mentioning this story, but internet research tells me that Tolstoy especially liked it. The father solves the problem by telling a moralistic story – “[t]his ending struck Yevgeny Petrovitch as absurd and naïve, but the whole story made an intense impression on Seryozha” – how Tolstoy must have agreed – but then ends on am impressionistic detail that would have made me date the story much later if I were guessing. This is a great one. Now usually translated as “At Home,” I think. The basic Chekhov chronology is that for several years he wrote lots of very short stories, sometimes two stories a week, but once he became famous enough to be paid well he started writing fewer but longer stories. So in 1886 he published 55 stories and in 1889 three. But he also became a more complex artist. Those three are all masterpieces. The later stories are pretty much all masterpieces. When Constance Garnett turned to Chekhov she translated 201 of his stories, somewhat less than half of what was available to her. She translated almost everything from 1888 on, the bulk of the material from 1885 to 1887, a little bit from 1883 and 1884, and one story from 1880 to 1882. Then she assembled her Chekhov in thirteen volumes, in her order. What a job she did. The first two or three volumes are to me the epitome of Chekhov, just perfect; then for several volumes Garnett roughs him up a little, lets him get stranger. All of this is still mostly the great, later stories with a few earlier pieces mixed in. Around volume 9 or 10, though, Garnett is running out of late ones, except for a few she has carefully saved, while she still has a hundred of the little 1883 to 1887 stories. She organizes them thematically, so that volume 10 is especially dark – Chekhov on horror, murder and madness – with “The Horse-stealers” (1890) and “Ward No. 6” (1892) leading off the theme in the late style. Volume 11 has more than its share of illness and doctors. And volume 12, most remarkably, is almost all about children, and if not children, dogs. The only late ringer, “Whitebrow” (1895) is about dogs. And a wolf; it is from the perspective of a wolf. Volume 12 is The Cook’s Wedding & Other Stories. I has not read it as a book until recently. I had dipped in, since it is the home of some of my favorites, like “Vanka” and “Oysters.” But I had not realized what Garnett was doing with her anti-chronological organization, how clever and effective it was, even with more minor Chekhov. Taken as a whole, Volume 12 does not seem so minor. Other Chekhov collections are good, too. It is hard to find fault with The Portable Chekhov, where you can read “The Lady with the Pet Dog” (Garnett Vol. 3) right after “Gooseberries” (Vol. 5) and just after “In the Ravine” (Vol. 6), all in one place, which is great; whatever Chekhov you read do not miss “In the Ravine,” right? Owning just The Portable Chekhov is wiser, I suppose. But those thirteen books Garnett assembled, what a treasure chest. I also recently read Volume 11, The Schoolmaster & Other Stories, as well as Volume 12, and what I plan to do is write a little about the contents of these two books, but I guess I am getting my little tribute to Constance Garnett, not just as a translator but as an anthologist, out of the way first. Why this turn by so many outstanding writers, and eventually readers, to such unpleasant characters? What motivates Italo Svevo (or Machado de Assis or Luigi Pirandello) to wallow in the blinkered selfishness of a protagonist, Emilio, who provides the narrative motion and ethical meaning of the novel by his complete failure to understand himself, where the irony of the novel is that he is always wrong? I have many conventional ideas on this subject, and will mention some of them before wallowing a bit myself. First, this is not the social realism of, say, Verga or Zola, who are going to show the world the way it really is, with all of the dirt and the grit. Not that Svevo was not reading Verga and Zola with interest. Nor is this the distant aestheticism of Flaubert, in which the empty amorality of the characters are in the service of the creation of an object of extraordinary beauty, perhaps. Not that Svevo had not absorbed Flaubert. No, here we see an example of a novel written against or across or within a background of the contemporary philosophy and science of 1898. Nietzsche, Darwin, and perhaps some precursors of Freud, or the actual Freud, just maybe. As a psychologist, Svevo is a peer of Freud. He is studying men, mostly himself, I suppose, who have lost not just their faith in the wake of these big modern ideas, but also their religion, their church. Society no longer even requests that they fake their faith. In the absence of God, what values does man substitute? Svevo has little interest in the religious aspect of this question, but he is interested in the void. The protagonist of As a Man Grows Older does not do so well in the face of the void – he has even written a novel, for pity’s sake – but other characters do all right. There are sympathetic characters in the novel, but Svevo makes me work for my sympathy. Emilio keeps blocking my view. Italian literature must be the most comically grim literary tradition of the 19th century. This is the second most important thing I have learned about Italian literature this year. I wrote down some more good ones, but probably not as good as the above, and while reading the most ironic aphorism-packed chapters (5 through 7), I did not take any notes at all. So these will do. The book at hand is When a Man Grows Older (not a great title) aka Emilio’s Carnival (terrible title) aka Senilità (actual Italian title), by Aron Ettore Schmitz aka Italo Svevo, published in 1898. It’s Svevo’s second novel. I haven’t read the first, A Life (1892). Svevo was so disgusted by the failures of these two novels that his third did not appear for twenty-five years, and even then it took the encouragement of James Joyce, who had been Svevo’s English tutor in Trieste, which is an unlikely story but I guess true. When a Man Grows Older is not as good as The Confessions of Zeno / Zeno’s Conscience (1923) – why Svevo’s titles cause so much trouble I do not understand – or at least not as good as the later novel’s amazing first chapter, the “last cigarette” chapter. The reason Senilità did not sell is that it was a hideously ugly book, judging by the photo at Wikipedia. The other reason is that the interior of the book is also quite ugly in a way that modern literature has trained us to endure but was apparently not so easily digested in 1898. Now we – some of us – are used to it. Emilio, who per the title is a man and who is growing older in the sense that we all are – he is thirty-five when the novel begins – picks up a young woman, Angiolina, on the street, a new adventure for him but not so much for her. Eventually their love affair is destroyed by Emilio’s jealousy and disgust at Angiolina’s lies about her sexual behavior. Sometimes it is all quite a lot like the “Swann in Love” part of Swann’s Way. But Emilio is a much smaller man than Swann. The novel’s subplots are about depression, betrayal, and death. Angiolina in some sense represents a life lived rather than delayed, impeded or destroyed. These corrosively ironic lines are practically the last of the novel. From the point of view of Emilio, which occupies most of the book, Angiolina has always been more of a symbol than a person. The ingenuity of the novel is that it lets me see Angiolina’s warm-bloodedness through the distorted perspective of Emilio. Angiolina has always been alive; Emilio in some more abstract state. “[I]n his emotion he had gone in search of images and metaphor” (218). The novel is a masterpiece of subtle and less subtle ironies. Quotations and page numbers from the NYRB Classics edition, translated by Beryl de Zoete. The title quotation, which describes the novel perfectly, is on p. 18. Saki’s first book of short stories, Reginald (1904), turns out not to be a books of short stories, despite leading off the Modern Library Short Stories of Saki. You knew this; I did not. The Reginald “stories” are newspaper humor pieces, jokes, satire, goofing around. The Modern Library edition compresses the “book” into 42 pages with no strain on the eye or margin. The vehicle for Saki’s jokes is his young aesthete Reginald, who if taken seriously is a lunatic, but what fool would take him seriously. None of the rest of his family had anything approaching Titian hair or a sense of humour, and they used primroses as table decorations. Draining the fun from that passage, I note that “weather forecast” is pretty cheap, but a joke that still looks like a joke. “Primroses” has lost any humor it might once have had. Almost requires a footnote. Oscar Wilde was so obsessed with lilies that they became a trademark of English aestheticism. I assume that helps me place the “primroses” joke, but who knows. “[S]aid disrespectful things about the universe” is larger than a joke. A statement of purpose. I give this as an example of something disrespectful, although one could argue the point. That’s Reginald as Wilde. Saki was of course in his early thirties when he wrote that line. That volcano is in what I think of as P. G. Wodehouse mode, which I suppose I should begin calling the Saki mode. Christopher Morley, in his introduction, says of Saki that “[a]unts and werewolves were two of his specialties” (p. vii), which werewolves aside sounds awfully like Bertie Wooster. That might be my favorite line in Reginald. Cuts two ways, don’t it? Saki’s next book seems, despite its title (Reginald in Russia), to contain short stories, which is close to but not really a shame. “He is a dear good fellow,” the young lady rejoined. “And he is a perfect husband. But all Americans are that,” she continued smiling. Little joke there from Henry James. All American ladies in Henry James stories from 1877 through 1879 have this passion for generalizing. That’s pretty close to true. “No, more you can.” And the elder of the young Englishmen unfolded his napkin. “I can’t understand them,” said the clever man. “What the deuce is he saying?” asked his comrade, appealing from the French waiter. 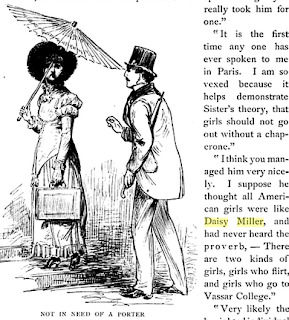 The Daisy Miller is “An International Episode” is actually an anti-Daisy Miller, a person no one will mistake for a frivolous flirt, well-read and knowledgeable about history and culture. In a shocking turn, almost unprecedented in modern fiction, Bessie Alden not only learns from novels but turns out to be right to have done so. Lord Lambeth should have read more, or better, novels. “The Pension Beaurepas” begins with Stendhal and Balzac and includes a funny parody of Père Goriot, with the Daisy Millerish daughter blowing through her sick father’s money. This Daisy Miller really is a shallow nitwit, interested only in shopping. She helped me see some of the nuance in the Daisy Miller of “Daisy Miller” who is sharper than she seems. 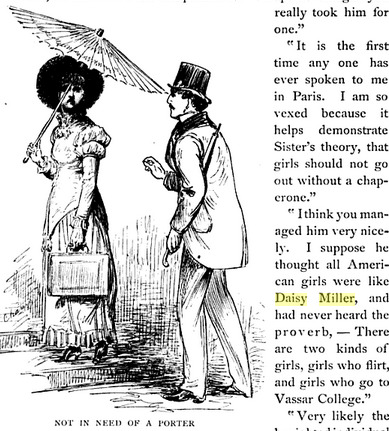 James is always rearranging the pieces in his stories (this one in fact has two Daisy Millers, one of whom is Europeanized and aspires to Daisy’s freshness and innocence). Where Miller’s father stays in Schenectady, and Bessie Alden’s brother-in-law stays in New York, the sad sack father of the dim Daisy of “Pension Beaurepas” is the comic high point of the story. … I inquired of my friend whether he had been long in Europe. Europe, for the American businessman, is a prison that for some reason has expensive shops where his wife and daughter can bankrupt him. The story is not really about him or his family – Simon Lavery’s post on “Beaurepas” has the actual story – but James ends the story with the stoic, depressed father. Another American victim of Europe, or more precisely, another American victim of Americans in Europe. He had a great relish for feminine beauty; he was addicted to observing and analysing it; and as regards the young lady’s face he made several observations. The Library of America volumes of the Henry James short fiction use the original texts, whatever appeared in the magazine, so “Daisy Miller” is titled “Daisy Miller: A Study,” which is pleasingly ambiguous. A study of whom? There are only two central characters. One of them, the Europeanized American Winterbourne meets the free-spirited completely un-Europeanized Daisy – “’Her real name is Annie P. Miller,’ the boy went on” – who is from Schenectady and is direct, fun-loving and willful. The point of view is split between Winterbourne and a James-like narrator, so it is never Daisy. She is always observed. Most early readers willingly followed Winterbourne’s gaze. Like him, they studied Daisy, the flirt, the “coquette,” as Winterbourne immediately imagines her. Someone a Vassar girl knows better than to imitate, even if Daisy never seems to do anything not allowed back in Schenectady. “[I]n her bright, sweet, superficial little visage there was no mockery, no irony” – this is all via Winterbourne again. Likely some of his impressions are true, but others are suspect. It is quite hard to pin down how shallow or cunning Daisy is. “Winterbourne had lost his instinct in this matter, and his reason could not help him.” A good part of what makes Miller such a good character is the work I have to do to push past Winterbourne to get to know her. Lately the interest has moved to the other subject of study, Winterbourne, in part through the “queering” of Henry James and the feminist rescue of Daisy Miller, but I think more because people likely to read the story now are more sophisticated or skeptical about point of view. So we begin asking questions about this odd bird who is studying Daisy. My opening quotation is odd. Does that sound like a man interested in a wife, or a mistress? The narrator twice passes on a rumor that Winterbourne is “extremely devoted to a lady who lived there [in Geneva] – a foreign lady – a person older than himself” in a way that casts doubts on the existence of such a lady. This double distance – the narrator observing Winterbourne observing Daisy – leads to lots of gaps in the story. The gaps can be ignore and one story results; if the deconstructionist or queer theorist peers into them other stories become possible. His story is sad. He stands in the line of James characters who miss their chance at happiness for false or trivial reasons. But Daisy’s is sadder. Di at The Little White Attic has been writing about “Daisy Miller”* and she identifies the two “most moving scenes,” both of which deepen Daisy Miller, whether or not Winterbourne understands what he is seeing. By the end he understand something. “’I have lived too long in foreign parts.’” I will note here that the characters in “Daisy Miller” are almost all Americans. The people who condemn Miller’s improper behavior – walking with an Italian man in a public place – are all Europeanized Americans. The other texts around “Daisy Miller” – The American and “The Pension Beaurepas” and so on have trained me to mistrust these folks. They fear that Europe will corrupt Miller. They should know. Oh, you think I am making this up. I assume that Vassar alumni still revisit the scene at the Musée de Cluny. Perhaps there is a plaque. Curiously, The American opens with its protagonist chatting up a copyist in the Louvre, but she is a French adventuress, not a Vassar girl, so the episode takes a different direction. Yesterday I wrote that we would likely not read, or have heard of, Henry James if The Europeans were his best book. This was a convoluted way to avoid the morbid – and highly useful for a writer with such a long career – “what if he had died?” question. At what point, if James had died, or let’s say retired, or become an eccentric recluse, suddenly stopped writing, that is what I mean, would he still show up in the Norton Anthology of American Literature? I am pretty sure that “Daisy Miller” (1878) would have done the trick. It is 1) unusually well-written, 2) about a subject of continuing interest – although the subject of interest has perhaps changed, 3) tricky in its dual points of view, neither of which is quite the right one, which keeps the reader on his toes, and 4) popular. No need for any later rediscovery of “Daisy Miller.” It was famous immediately, in England and the U.S. A big hit. A pop culture reference that five years later could be casually dropped into Three Vassar Girls Abroad. Everyone knew who Daisy Miller was. Or more importantly what – a flirt. Whether she is what the Vassar girls think she is, that also gives the reader something to do. You gotta give readers something to occupy their capacious and active minds. Irony gives them something to chew on. Winterbourne looked along the path and saw a beautiful young lady advancing. “American girls are the best girls,” he said, cheerfully, to his young companion. That’s James, not Three Vassar Girls, although they would agree with the sentiment. * The title continues: Rambles of Three College Girls on a Vacation Trip through France and Spain for Amusement and Instruction, with Their Haps and Mishaps. With their haps. For some reason I have not actually read this novel. Ma femme discovered it, and the “Daisy Miller” scene, years ago, researching who knows what, and I have squirreled it away until now.